Ethnic Cuisine | Visit Russia in Arizona! Hot Teas – black, green, and herbal teas are Russian hot beverages that are popular throughout the different republics of the Former Soviet Union. Russian Kvas (Kvass) – Russian (rye) malt beverage is ancient and beloved beverage from Slavic Europe. It is borrowed in the 16th century from Polish Kwas, meaning “acid”. In English, sometime called a bread drink, is a fermented beverage. Kvas is a perfect thirst quencher for the summer time. Samovar – A heated metal container traditionally used to heat and boil water for making tea. In old times wood or charcoal was burned inside the special chamber of the samovar to boil water. Modern samovars are electric. Samovars have an attachment on the tops of their lids to hold and heat a smaller teapot filled with a strong concentrated tea, usually made with loose black/green tea or herbal/berry teas. The concentrate then is being deluted with the hot boiled water. 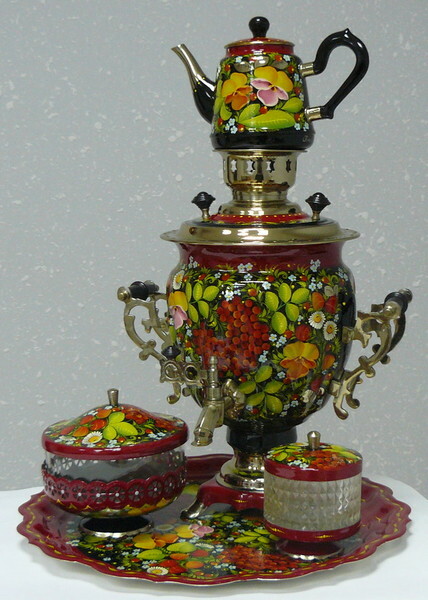 In modern times, the samovar is mostly associated with Russian exotica and nostalgia. Green Salad – salad often made with fresh vegetables such as cucumber, tomatoes, green onions, bell pepper, radishes, dill, parsley, and dressed with sunflower or olive oil. Venegret – One of the Russian salads (some of them Mimoza, Olivie, potato salad, egg salad) There is no Russian party without this salad. Venegret is made of boiled winter vegetables: beetroots, carrots, potatoes, green peas, beans, sauerkraut or pickles, onion, and dressed with sunflower or olive oil. Mimoza, Olivie – salads that have boiled winter vegetables, fish, or meat, eggs, and dressed with mayonnaise. Sel’d’ Pod Shuboi (Herring under the fur coat) – Layered salad composed of diced salted herring covered with layers of grated boiled vegetables (chopped onions, potatoes, eggs, carrots, beet root), covered with mayonnaise as the last layer or between every layer of vegetables. Grated boiled beet root, covered with mayonnaise as the last layer, gives the salad a rich purple color. Dressed Herring salad may be decorated with grated boiled eggs, parsley. Dressed Herring salad is very popular in Russia, Ukraine and other countries of the Former Soviet Union. It is one of the traditional dishes served at New Year Eve, Christmas , Birthday and other celebrations. Borsh – Russian soup usually containing beetroots, carrots, cabbage, onion, potatoes. Can be meat broth based, or vegetarian. Beetroots give this soup a traditional deep read color. Shchi – Russian soup made with sauerkraut (sour cabbage), potatoes, onion, meat broth based or vegetarian. 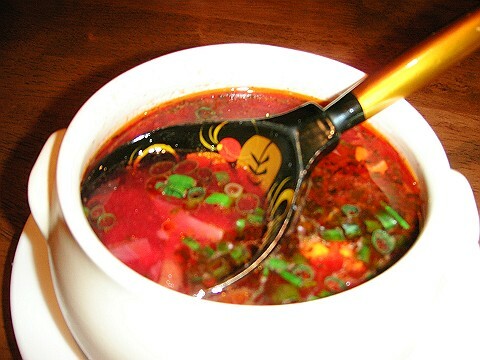 Ukha – Popular Russian fish soup that is made of fish, potato, onion, eggs, a bit of ground black pepper. Okroshka – A cold soup based on kvas or less often sour milk. The main ingredients vegetables like in green salad that can be mixed with cold boiled meat, boiled potato, eggs, and kvas. Draniki – potato pancakes usually used as a side dish. Golubtsi – cabbage rolls stuffed with ground meat and rice. Cabbage leaves are precooked to the soft condition, then stuffed with filling and cooked to perfection. Kotleti, Bitochki, Tefteli – meatball dishes. It is a main dish served with mashed potato, pasta, rice on a side and bread. 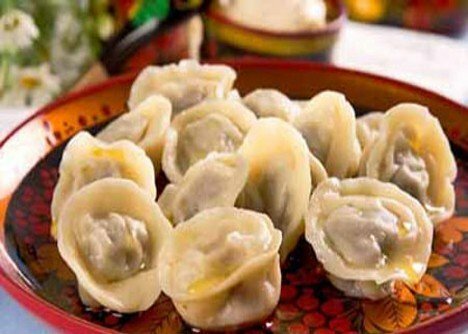 Manti – dish that had spread from the Central Asian Republics . Manti were popular throughout the Former Soviet Union, a large dough pockets that usually filled with finely chopped meat and onion. It has to bee cooked in a special steam pot. Pelmeni – A dish that is traditionally from Tatarstan and Siberia , now considered part of Russian and Ukrainian cuisine. Pelmeni is a type of dumplings consisting of meat filling. They first made as a half circle, then enclosed into a circle shape like ravioli. Pelmeni are boiled then strained. Russian Shashlik – Shyshyk is Turkish way of grilling meat, popular in India Israel, and Russia. This form of skewered dish was popular throughout the Former Soviet Union. 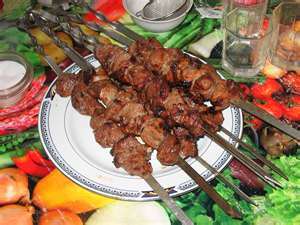 Shashlik is a type of kebab, made of marinated skewered lamb or pork. Shashlik is food for Russian outdoor parties. It is marinated meat grilled on charcoal to perfection. It could be combined with grilled vegetables. Vareniki – associated with Ukrainian cuisine (Varenyky) little semicircular pockets of dough filled with anything from fruit to liver. Rusian Vareniki are kind of stuffed dumplings. Can be stuffed with potato, cabbage, cottage cheese, berries. Vareniki are boiled then strained. 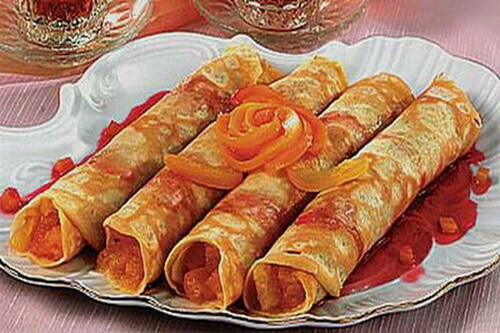 Blini – Traditional Russian very thing pancakes. Blini can be plain, topped with sour cream, or filled with jam, cheese, caviar. Kulich – sweet yeast bread studded with nuts and fruit, raisins, is traditionally served in Russian and other Eastern European homes on Easter. Makoviy Rulet – sweet poppy seeds roll. Russian Pirogi (Pierogi, Pirozki) – a small pastry turnover with a filling as of meat, cheese, eggs, mashed potato, cabbage, fruit, berries, It is baked or fried. Vatrushka – A pastry with a ring of dough and sweet cottage cheese filling in the middle. It is typically made with a sweet yeast dough. Caviar – black or red caviar, is a delicacy, consisting of processed, salted, non-fertilized sturgeon roe. Caviar Butterbrod – Slice of bread with spread butter and caviar over butter.